I love flowers so much and choosing a florist was one of the first things I did when we started planning our wedding. I think that after booking the reception and the church, it was probably the next thing on my To Do list! If you're a bride-to-be then I hope that this post will help you with making arrangements for your wedding flowers. I started off by arranging appointments with various florists in the area to see some examples of their work and obtain quotes. 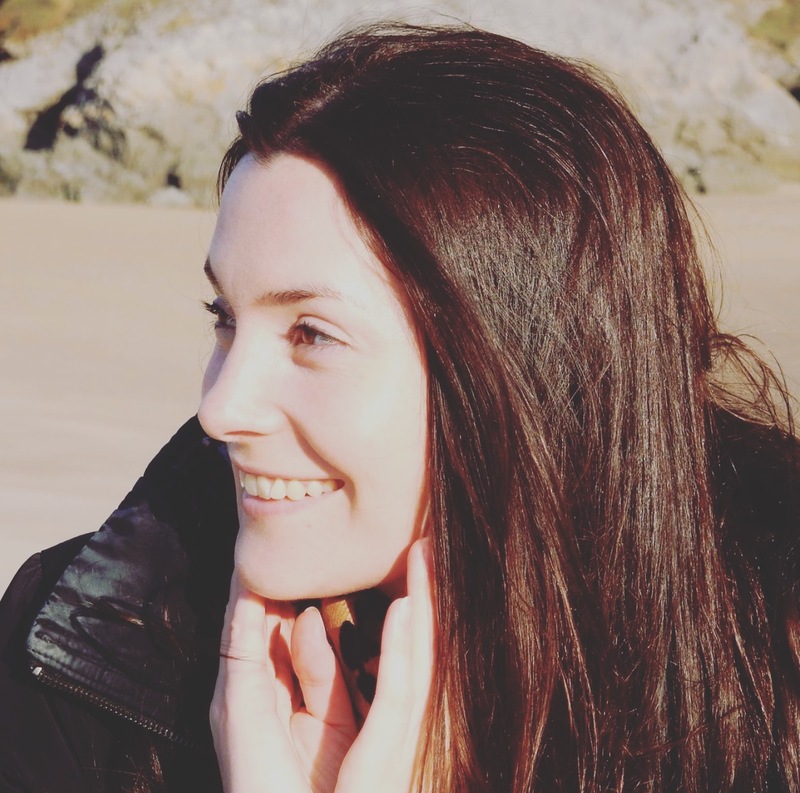 I chose Ruth Milton Jones, a florist based in Swansea; she's so lovely and I was really impressed with the flowers she'd done for other weddings. She gave me confidence that she would be able to put together a beautiful package of floral arrangements and displays for the big day, and she did just that! I chose seasonal springtime flowers which complimented my colour scheme and smelt so lovely. 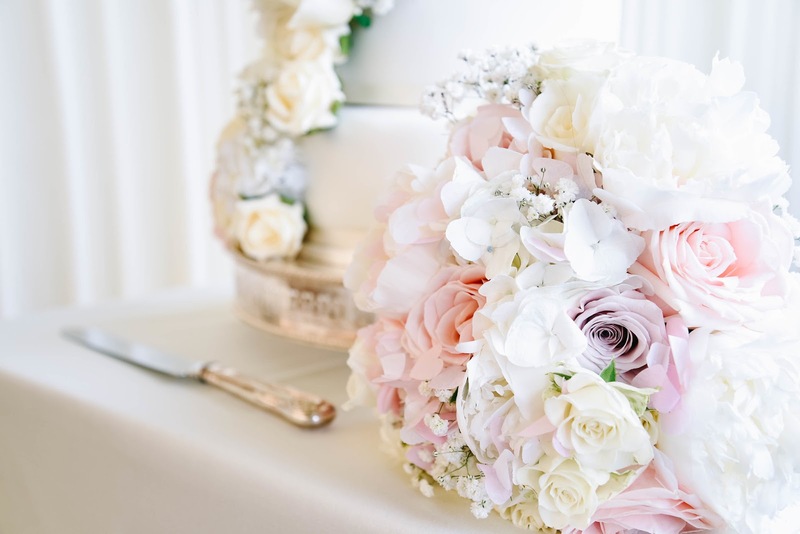 I didn't want anything too outlandish, nor did I want too much greenery; I love pinks and ivory colours because they are so pretty and romantic. 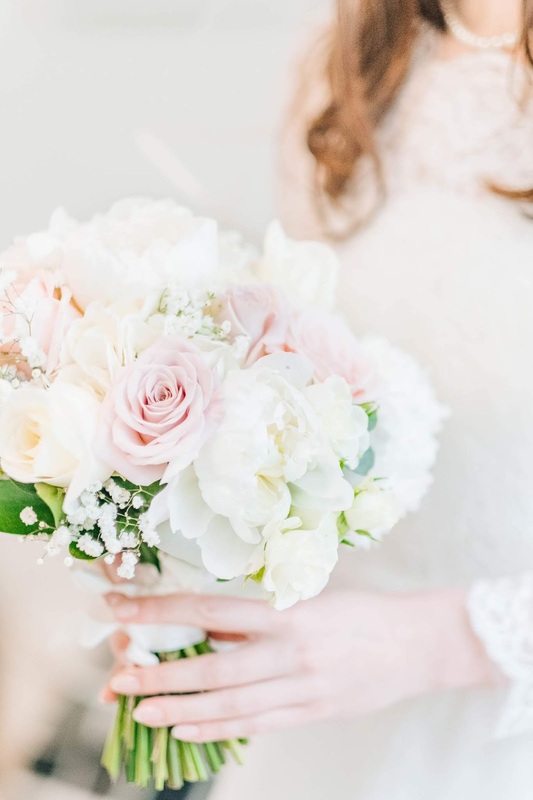 I discussed various ideas with Ruth and I eventually decided to have beautiful blooms of ivory peonies, white hydrangeas, sweet avalanche roses, blush roses and white gypsophilia. I had a hand-tied posy, and my bridesmaids had similar bouquets which were slightly smaller than mine. 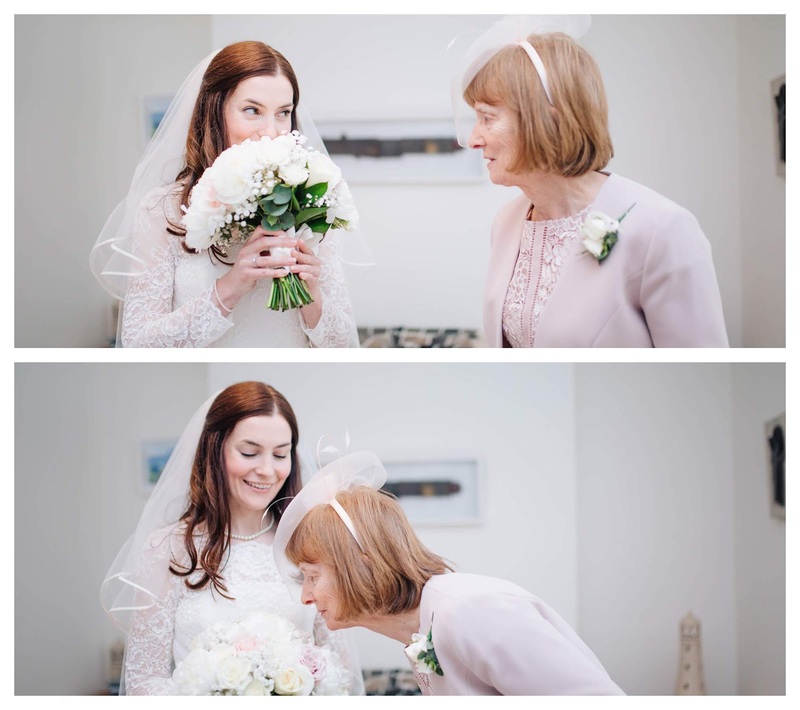 When the flowers arrived on the morning of the wedding, it was exciting because I wasn't sure exactly how they'd turn out but they were better than I could ever have imagined them to be. Ruth had worked so hard at putting all the arrangements and displays together and it was definitely a highlight of the morning when I got to see (and smell!) the beautiful bouquets. Telling mum how amazing they smell! I had flowers on plinths outside the main entrance to the church and more flowers on plinths at the altar. We also had posies of hand-tied gypsophilia tied to the ends of the rows of seats. I loved the idea of having an archway of flowers outside the main entrance to the church but I quickly ruled out this idea because it was quite an expensive option, and the fixtures and fittings which are used to attach the flowers to the archway could have damaged the church building. 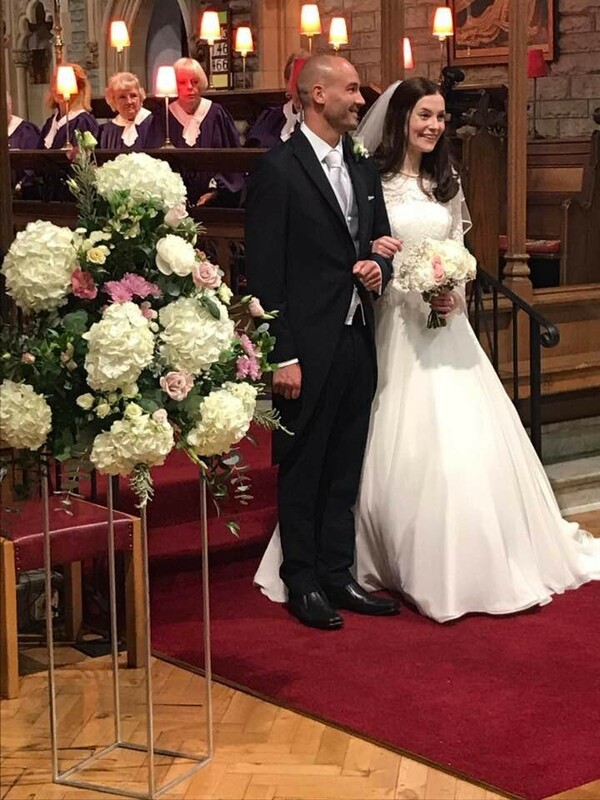 After the ceremony, my brother-in-law kindly transported the flowers from the church to the reception at Oxwich Bay Hotel, so we got twice the use out of them. 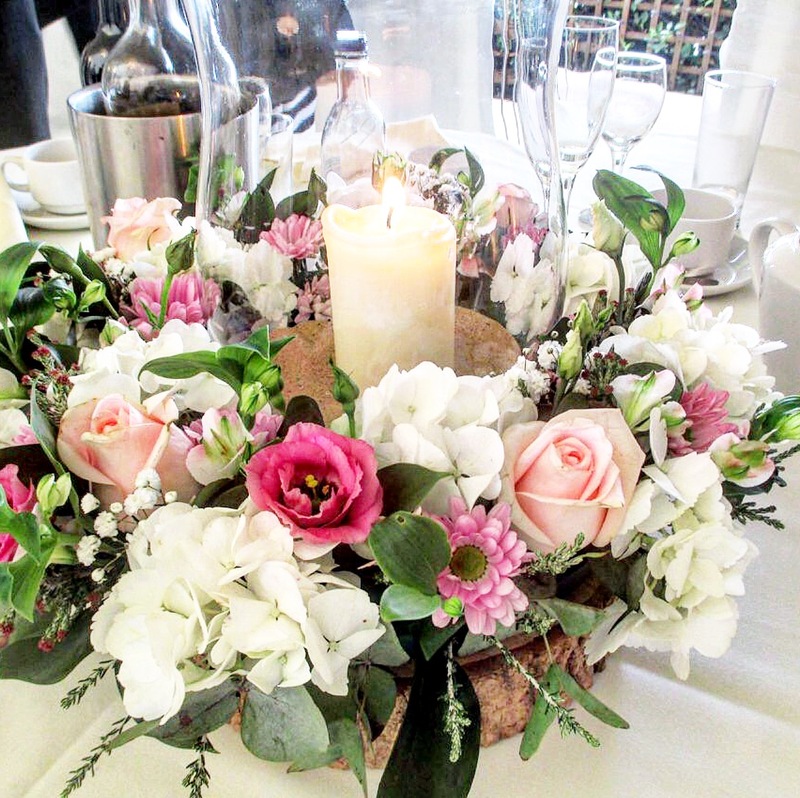 For our table centres at the wedding reception I had a wreath of flowers around a glass vase with a pillar candle in the centre. I loved the idea of having candles on the tables because they add to the atmosphere of a special occasion. The vases and candles were provided by Oxwich Bay Hotel, so this saved me having to source something for each table. I didn't want a flower arrangement that was too tall because I wanted our guests to be able to see each other at their tables, so this option was perfect. My cake was from M&S and Ruth decorated it on the morning of the wedding day with real and artificial flowers to match my bouquet. It looked so beautiful; I'd seen a photo of something similar on Pinterest, so I'd shown it to Ruth, told her it was my dream wedding cake (no pressure, Ruth!) and she recreated it for me. 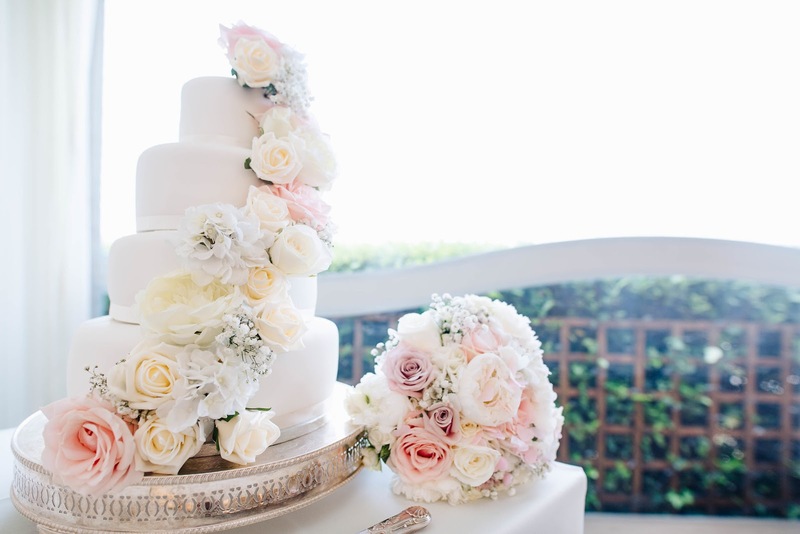 I loved how the flowers cascaded down the four tiers of the wedding cake. After the wedding, our flowers went to good homes. We gave them to our neighbours, family members and friends. Two of the wreaths went on my grandmas' graves; I know that they would have loved them. Our wedding flowers were very special and I will always remember how beautiful they were. Get ideas from Pinterest and photos from other weddings. Think about your colour scheme and how your flowers will fit in with this. 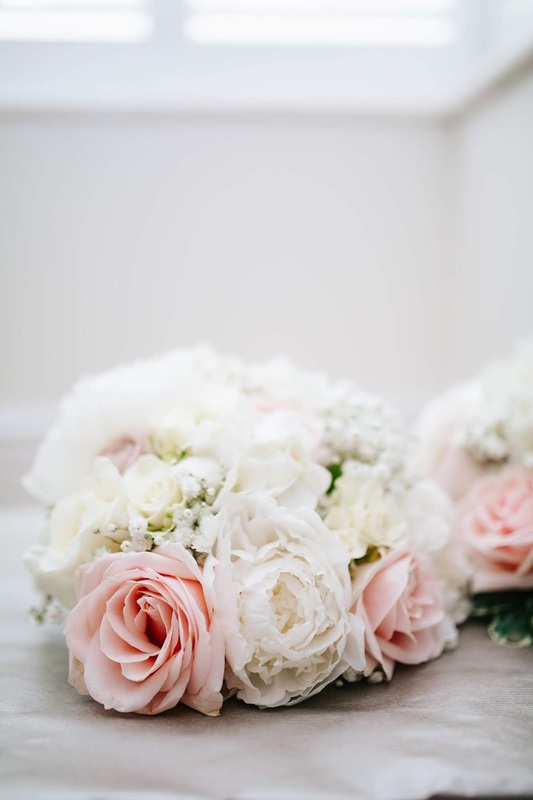 Choose a florist who's reliable and has great reviews; ideally someone local who is familiar with your wedding venue and reception.